Get distracted easily while writing in Microsoft Word? Don’t like all the visual pizazz that toolbars, scroll bars, and buttons bring to your word processor? Metaclassy has released a new bare-bones word processing app called Byword that should satisfy your minimalist desires. It’s available now in the Mac App Store for $5. Byword turns the entirety of your Mac’s screen into a blank white writing canvas, free of toolbars or superfluous buttons of any kind. To begin writing on the page, all you have to do is start typing. This visual chasm, Metaclassy hopes, will let users focus more on their writing, and less on distractions like programs running in the background, or a word processor’s bells and whistles. The app is similar other stripped-down word processing software, like WriteRoom ($25), OmmWriter Dana ($5), and even TextEdit (free in OS X). But unlike those programs, which have translucent or fully visible toolbars for modifying text, Byword allows you to just use specialized keyboard shortcuts to alter your words. Among the shortcuts available: find and replace, spell check, grammar check, focus (fades out all but a select portion of text), and print. You can also export a PDF into a document, as well as print. To bring up formatting options, select the text you want to change and a pop-up window will appear. 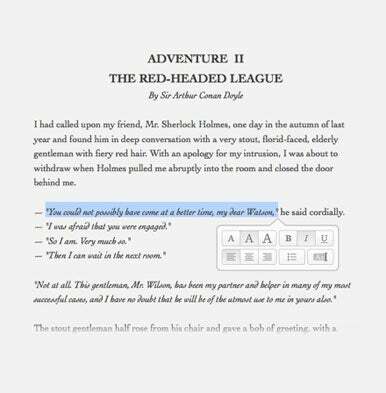 Byword’s attractive, distraction-free interface just might be a cure to your writer's block. The 0.3MB app runs on 64-bit Macs running OS X 10.6.6 or later. Metaclassy plans on adding 32-bit support and word and character counts in a future update.